Note: This is a guest article contributed by a paramedic and fire fighter, Scott. Today I found out how the heart works. I know what you’re thinking; I hope by the end of this article I can find out if it really is true that I can MacGyver an electrical cord together and shock my heart into restarting should it stop! Quick answer….. maybe, if you’re an electrical engineer with all the appropriate gear, or go buy an automatic external defibrillator (they’re really not that expensive). Before you budding electricians all rush on out to RadioShack for all the equipment, let’s find out how this beast of an organ works. The heart is a two part pump, one part mechanical and one part electrical. 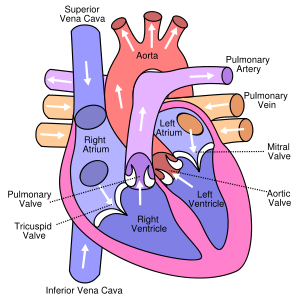 The mechanical function of the heart is governed by the electrical system within the heart. That electrical system, in turn, can be affected by neurotransmitters from the brain (or fancy pacemakers created by the Dr. Frankenstein-like minds of the world). But since we’re only talking about the heart today, we will only focus on the ability of the electrical system of the heart. Should you want to know how the brain governs it, I direct you to the many medical schools around the country! The heart is a four chambered pump. The top two chambers are called Atria, the bottom two are called Ventricles. They are separated from top to bottom by valves; the right and left sides are separated by a septum. So what makes the pump squeeze? Well the heart is a muscle, and like all muscles, when it gets shocked by electricity, it contracts. If you don’t believe me, just stick a fork in the nearest electrical socket and see if anything tenses up! (DISCLAIMER: Due to our lawyers incessant need to justify themselves, they advised us to say, “Don’t do that. It could cause you harm”). When the hearts muscle gets “shocked”, they contract and force the blood down its path. The valves I just spoke of are one way, and will not allow blood to flow back through the system. If it does, see your nearest physician cause death could be imminent! The blood’s path through the heart starts in a vein called the Superior Vena Cava. Then it enters the right atrium, flows through the tricuspid valve into the right ventricle. From there it travels through the pulmonic valve into pulmonary arteries, then the lungs. Take a deep breath. Awe…… the sweet feeling of oxygen entering the blood! Now let it out, OOUU….. the halitosis laden Co2 leaving the body! Now back to the heart and into the left atrium, through the mitral valve and Walla! The blood is now in the “strongest” chamber of the heart, the left ventricle. From there it gets pumped through the aortic valve and into the aorta and out to the rest of the body! 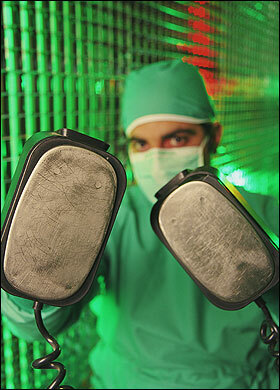 So what causes that infamous electric shock the heart receives, approximately 60-100 times a minute? Short answer: chemistry. Long answer: The exchange of electrolytes across specialized cells within the heart build up a differing electrical potential on either side of the cell. When this electrical potential reaches a certain amount, it discharges and sends a shock down another unique set of cells within the heart, causing a shock and thus the contraction. The specific set of cells that regulates the heart rate (in most people) are called the Sinoatrial node or SA node for short. The SA node (pacemaker of the heart) sits in the upper portion of the R atria near the entrance of the superior vena cava. When the SA node sends out and electrical shock, it immediately shocks the atria. 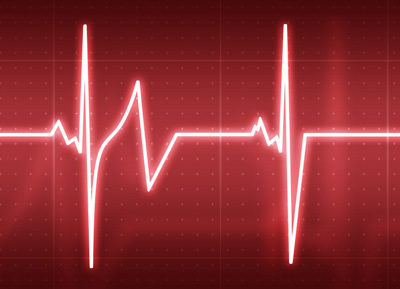 The pulse then gets “held up” in another set of cells called the Atrioventricular node, or AV node for short. This then transmits the impulse down to the bundle of His (no, not the bundle of hers, sorry ladies) and then to two pathways called the right and left bundle branches. Then it’s transmitted to the rest of the Ventricles through what are called Purkinje fibers. All together this “shock” causes the atria to contract, then the ventricles. The wonder of a pulse!! So what and how do these electrolytes cause this shock? In an attempt not to give a physiology lecture of ungodly like proportion, I will simply say; the main two electrolytes involved are sodium and potassium. Potassium normally sits inside the cell, and sodium outside. Potassium slowly leaks outside of the cell and sodium then goes inside the cell. This creates the differing electrical potential that builds up until the point of discharge. Other electrolytes also help in creating this differential, and they are calcium and magnesium. For how exactly all these electrolytes actually cross the cells membrane I will only say that it would take way too long to explain in this article, so trust me, they do. All together the harmony created by this yin and yang system of electrical and mechanical systems come together to make that wonderfully thumping thing inside your chest! So let’s talk about this infamous “shocking” business. When the SA node becomes damaged, or simply isn’t working properly, other parts of the heart start to take over to create the heart beat. There are millions of foci in the heart that can make this beat happen. The reason why they normally don’t is that the SA node “overrides” them and they accept the impulse from it, instead of trying to create one on their own. When these foci start to beat on their own, they can create an electrical impulse that simply doesn’t create the mechanical squeeze necessary for blood flow, thus no pulse. When this happens if you “shock”, known as defibrillation, all of these foci, you get them all to depolarize at the same time. Then the hope is that the SA node, or some other foci, will take over and create a pulse producing rhythm on its own. Like most of the body, the heart does not receive blood flow when it contracts, called systole. The heart receives its blood flow when it relaxes, called diastole. This is why when someone has an extremely fast heart rate, like say 180-?, the person could feel light headed due to the fact that their blood pressure will be low. This is because there isn’t enough time between contractions for the heart to receive enough oxygenated blood. The slowest heart rate I have seen, in a conscious person, was 28. And yes, they also received a pacemaker. Mechanically, should the heart stop contracting, the only way to move blood through the body is with CPR compressions. I had cardiac arrest do to thrombosis lesion in my LAD, woke up 2 hours later on the floor, drove 30 minutes home, went to ER, they put a stent in. My cardiologist said my heart restarted by luck. I had a MI over 10 years ago; after surviving a delay of over 2h. before treatment, they detected 100% block in the main artery and 50% to 70% block in the loop arteries through angiogram. multiple pills – ARBs, ACIs, strong doses of aspirin , beta blockers and statin restored partial cardiac function and after undervation for over 10 days, angioplasty was done with a DES. I am on the ARBs , statin, aspirin and DAPT and now on prazosin – with alpha blocker since angioplasty. Now the query is: I could have been better off with a polymer biodegradable stent which may also have promoted angiogenesis and I would have been relieved of a foreign metal body worn for life. Now , what if, I have to face another cardiac episode as a result of a sternum fracture. The cardiologists need to work out a safe option.